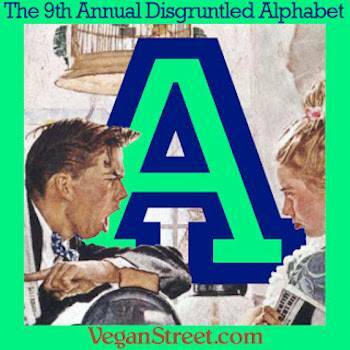 Z is for Zeal because, honestly, vegans are a passionate bunch. Should we be boring instead? is for Arguments in vegan Facebook groups - Is sugar vegan? Of course it’s not! Neither is oil. Neither is cooked food. What about GMOs? - on vegan Facebook pages that continue for weeks and have 8,019 comments and 14,067 GIF reactions last you checked. is for the Bones collected on someone’s plate at a business lunch that make you want to cry, puke and flee the premises all at the same time. is for the Co-worker who uses the microwave to cook fish. Who does this??? Word to the wise: even flesh-eaters think you’re gross and inconsiderate. is for the Distance that is between you and the nearest all-vegan Indian buffet is always too far. is for Fake foods. Okay, you call vegan proteins “fake” when you’re eating dead animals that have had their heads, organs, feathers and skin removed, blood drained, have been dipped in acid baths to kill bacteria and are wrapped in plastic? Sure, tofu and seasoned wheat gluten is all kinds of fake. is for Golly, you want me to apologize because you feel Guilty? How long are you willing to wait? is for Hitler was not a vegetarian, actually, and if playing that card is a way for you to justify your meat-eating - and imply that vegans are a bunch of mass-murdering dictators at heart apparently - I raise you Idi Amin, Pol Pot, Saddam Hussein, Josef Stalin and on and on through the ages, all meat-eaters. (Like Hitler). is for the Inkling that your server wasn’t listening when you ordered is proven correct when your meal arrives with chicken pieces on it. J is for the Jokers who bring a bag of tortilla chips to the vegan potluck and fill their plates with ALLLLLLL the food like they just ended a two-week fast. is for the Keyboard warriors in their parents’ basements who have devolved to only speaking in GIF form now with their anti-vegan arguments. And I thought you were lazy when you just randomly shouted “MMM...BACON” all the time. is for the Last item on the ingredient panel being whey or milk powder. is for the Morgue you have to see and/or smell in the grocery store when the meat counter is close to anything you need. is for the New vegan burger everyone is so excited to try being served at a national chain on non-vegan buns with dairy cheese because someone hates us. Who advised you??? is for Om, yeah, but I’m giving your spiritual practice the side-eye if you eat other animals because Deepak Chopra or some other “guru” says it’s okay. You can’t meditate that senseless violence away. Namaste. is for “Plants feel pain.” Really? After almost 23 years of hearing this, I would pay for someone to give me a thoughtful and coherent - or at least original - argument against veganism at this point. is for the Quest for a vegan partner on a dating site has netted one pescatarian, two reducetarians and one former-vegan-turned-Paleo. is for Sardonic detachment is my resting state now. is for Trendy, annoying people with huge social media platforms who try veganism on one day and discard it the next like last year’s fashions. Not today, Seitan. is for the Uncle who sits next to you at Thanksgiving and talks about the article he read that said bacon lowers your cholesterol. By the way, can you water his plants when he’s getting the new stent put in? is for the Verbose individual sitting next to you on the three-hour flight who sees your vegan button and decides to tell you all about how bone broth has changed her life. is for Wandering the whole food court for 30 minutes and ending up with a plain baked potato and some looks of bewilderment and pity. is for the xylitol-sweetened, rice flour muffin that could double as a hockey puck being the only vegan option your local bakery offers AND the message they’re sending into the world about what vegan food tastes like. is for Yodeling shepherds and shepherdesses are not responsible for your pricey sheep’s milk cheese, I don’t care how much you buy into the humane myth. is for Zeal because, honestly, vegans are a passionate bunch. Should we be boring instead?